Annet Gelink Gallery proudly presents the fourth solo exhibition of Carla Klein (Zwolle, 1970). Having made a name for herself through the years with her paintings of landscapes, Klein is now showing her newest series of paintings in combination with photography. The Stedelijk Museum in Schiedam exhibited her work this spring at the Skylines exhibition. Last year her work was amongst others on display at solo exhibitions at Tanya Bonakdar gallery in New York and private museum Jarla Partilager in Stockholm. Carla Klein made for this exhibition a broad selection from her newest series of paintings, which are on display in two specially equipped rooms. The paintings are shown in groups, above and under each other, emphasizing her serial manner of working. In addition, she is exhibiting a series of light boxes in the project room 'The Bakery'. The lion's share of the paintings originates from the series that Klein made during a road trip through the southern state of Texas (United States), adjacent to Mexico. Driving around, she photographed the desolate scenery. This way of taking photos yields images full of movement, which back in her studio in Rotterdam she has made returning in her paintings. Carla Klein is balancing on a thin line between figuration and abstraction in her paintings. Some of the paintings show the emptiness of the Texan landscape, which works at the same time alienating and very attractive. By using the emptiness as a subject Klein renders a complex look on the idea of conveying reality. The fact that she paints from photos and prints instead of from reality, adds greatly thereto. In addition, it seems in her paintings as if there are two worlds next to each other. Not only the landscape is depicted but also the space in the car is - sometimes unnoticeable - present. By photographing from within the car, the car window separates the inside world from the outside world, as subtly depicted by Klein. Carla Klein uses both analogue and digital photography. By using digital photography she grants herself much leeway, both in regard to the decisive moment of making the photo and in regard to selecting the photos for her paintings. New in this exhibition is her use of colors in some paintings. Where one is used to the blue-grey, sometimes almost silver tints, she is now for the first time showing also black-white paintings. They have been painted after photos that were, for example, made by night or were underexposed. 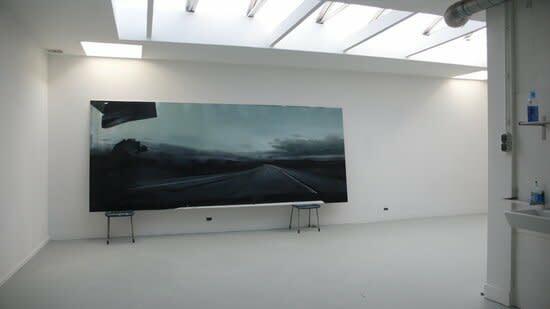 By leaving gaps in the hanging of the paintings, the photographic working method is emphasized. The overwhelming nature, emphasized by a low horizon and large skies, with here and there fragments of human interventions - a piece of highway, a traffic sign - make one reminiscent of the 17th century Dutch landscape painters. By choosing the landscape as a subject she places herself in a deeply rooted art-historical tradition. But Carla Klein's landscapes represent more than just the landscape. By focusing on, normally speaking, unimportant details for us, they yield a change in the point of departure of classical painting. Klein is painting about the trip instead of about the destination. The journey is the objective in itself. The photographs remain as the documentation of reality. Except for the paintings, Carla Klein is showing a series of photos in The Bakery. She made these photos - presented in light boxes - some years ago in the north of Finland. The darkest time of the year and the extreme cold produced almost surrealistic photos. The series shows the changing light and the way in which this phenomenon influences the landscape. By placing black light boxes next to the photos, she again plays with the character of digital photography: like thumbnails in a folder on the computer, the light boxes are placed on the gallery walls.